"Asos has launched a mobile optimised web site allowing customers to browse and shop across categories including womenswear, menswear, lingerie and accessories. The site is accessible via all mobile devices including Android, Blackberry, Symbian and the iPhone. The online retailer revealed that 24,000 orders have been placed through mobile phones on its main web site over the last six months. 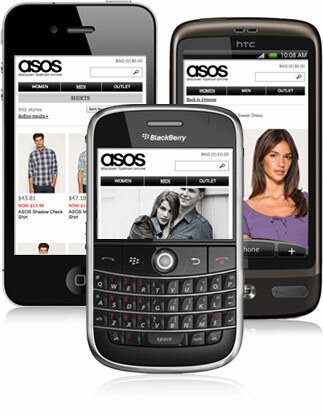 Asos attracts 175,000 visits via mobile devices every week. The e-retailer also announced sales surged 47% in three months to 30 September. Total sales rose to £69.7 million with UK sales rising 21% to £43.6 million, while international sales soared 128% to £26 million. Asos said overseas sales are now highest within the EU, where shoppers spent 71% more, however, the fastest growth was seen in the United States, where sales rose 293%. Nick Robertson, chief executive, said: “I am pleased to report continued strong sales growth, both in the UK and internationally. Our US web site launched in September and we expect to be live with both our French and German websites by the end of October 2010. With retail gross margin ahead of prior year and costs tightly managed, we expect our full year results to be in line with market expectations.” "